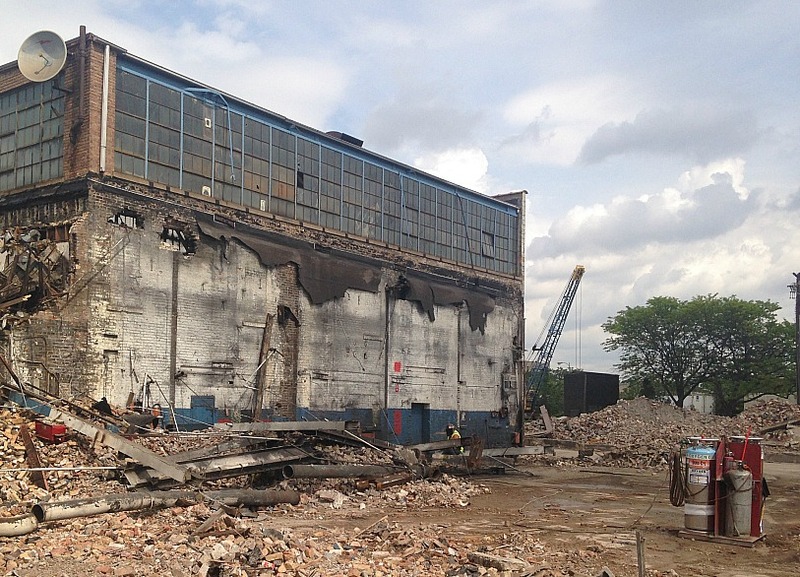 Piles of rubble and empty buildings are about all that’s left of the old Finkl steel plant. Around Lincoln Park and Bucktown this summer, neighbors have been talking about a zoning designation. Here in Chicago, it’s the responsibility of the alderman to figure out just how to balance all those passionate interests and ideas. And in the 2nd ward, this big opportunity falls in the lap of a brand new alderman, who’s still trying to move out of his campaign office. “I am looking forward to leading a community-focused process to find out what the neighborhood wants,” Ald. Brian Hopkins said, sitting at his desk in what used to be a closet in his campaign office. But the neighborhood is way ahead of him. When the A. Finkl & Sons steel plant opened its new facility on the South Side in 2011, it left about 30 acres of land in its old North Side home, inspiring many neighborhood conversations about possible congestion fixes, industry, retail development or housing. But one of the biggest questions at the core of all these ideas, is whether the land the steel plant and surrounding buildings sits on should stay as a “planned manufacturing district” or PMD, which protects industry from any encroaching non-manufacturing development. Mike Holzer was on the team that helped come up with that zoning tool. In the late 1980s, he was a graduate school intern at what’s now North Branch Works, a nonprofit that’s worked with Finkl and other local industries for decades. At the time, Lincoln Park was a hot spot for yuppies--a new term then--who were looking for places to live that would be an easy commute to their downtown jobs. As the yuppies moved in, retail and residential development quickly followed. “This area could have very easily been lost if not for firms like Finkl, SIPI Metals and other firms that basically said if unchecked, zoning changes will lead to us being displaced and is that really something you want, city fathers?” Holzer said. Fast forward to now, and there are a number of these industrial districts along the Chicago River and Kennedy Expressway on the city’s North Side. And as the plans for the old Finkl site start to bubble up, Holzer and the North Branch Works team want to make sure the zoning stays that way - for the benefit of the entire city. “One horse towns like Detroit that put all their eggs in one basket really struggled, and Chicago, because it has a broadly diversified economy, it has not struggled, it is in fact growing,” Holzer said. Holzer and his team put forth a pretty compelling argument, complete with employment data, an area study paid for by the Environmental Protection Agency, and a transportation plan down to the last parking spot. But as they’ve taken their pitch on the road to community meetings, it’s obvious that they’re not the only residents with ideas for those open acres. And many of those ideas are passionate and researched. “How in the world is so much river access, which could be fantastic for citizenry, how is it so decrepit, how has it come to this? It’s simply inaccessible to citizens of Chicago,” said Scott Nations, a local homeowner and former Ranch Triangle neighborhood group president. Nations said he wants the city to open up the Finkl land to all kinds of developers, including residential. He’s not looking for anything too crazy, but suggests some low-density housing and some open space -- which means get rid of the PMD. Nations and current president Randy Steinmeyer say it’s not that they’re against industry; in fact, they’d like to see something similar or connected to the UI Labs open up in the old Finkl zone. But in their opinion, the PMD didn’t work like it should have, or else Finkl and other manufacturers wouldn’t have left. “I don’t envy the man, unfortunately. I’m sure he’s being swarmed by developers as we speak,” he said. Some of that pressure hit Hopkins before he was even elected. A search into state campaign records turns up a number of names of donors who are also developers -- developers who have publicly voiced interest in the Finkl site. Two of the current landowners, Bruce Liimatainen and Joseph Curci, who are also former Finkl administrators, and their wives gave the then-candidate Hopkins $28,000. Hopkins also received $10,000 from the property owners of former A. Lakin and Sons company, which sits right next to the old Finkl site and is also for sale. “I come to the table with no preconceived biases whatsoever, I am truly a neutral party in all this. I didn’t have any allegiances with any of the companies we’re talking about, with any of the developers who are trying to acquire the land,” he said. “We need to be open to new ideas. And a planned manufacturing district is almost like a set of handcuffs. You know, it really limits what you can do. We don’t need limits right now,” Hopkins said. The alderman can be sure there will be a lot of people in Lincoln Park this summer with something to say about that. Lauren Chooljian is a WBEZ City Politics reporter. Follow her @laurenchooljian.